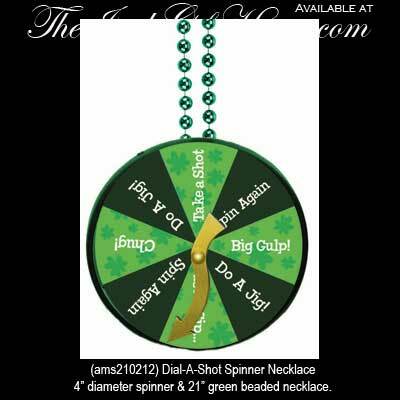 This St. Patrick's Day jewelry is in the form of a dial a shot game. This Irish necklace includes a strand of green beads. Spin the dial on this piece of St. Patrick's Day jewelry to see your task. You might have to Chug!, Do A Jig!, Take a Shot!, Spin Again!, Big Gulp! or Just a Sip. The Dial-A-Shot Spinner Irish party necklace from The Irish Gift House features a 4” diameter dial and 21" long strand of green beads.